The emails also provide evidence that Google was coordinating a stealthy mechanism with the White House to channel funds to an internet governance body that would uphold its interests, while concealing its own involvement in the effort. 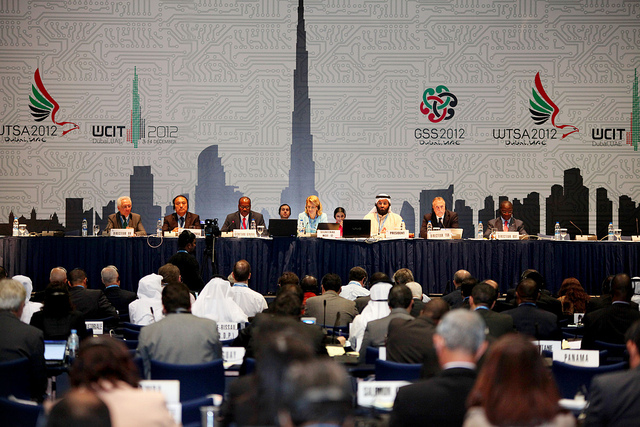 The international conference was convened by a UN agency responsible for international telecommunications issues, the International Telecommunication Union (ITU), to renegotiate the rules that govern information traffic across borders to make operators able to communicate. Prior to WCIT-12, the regulations hadn’t been negotiated since 1988, before most people had heard of the internet. The rules may seem arcane, but they had the potential to upend Google’s business model. One proposal would have expanded the scope of the rules to include internet companies like Google. Another would have made them pay other nations’ telecom operators for sending data through their networks. While it’s usual practice for the person placing an international telephone call to pay, that hasn’t been the case for sending data across international borders. The European Telecommunications Network Operators’ Association (ETNO) and telecom service providers from developing nations argued for a “sender pays” model for data transmissions, saying U.S. internet companies like Google were “free riding” on the telecom infrastructure of developing countries. Western internet companies like Google should therefore compensate those companies for providing the infrastructure that allowed them to reach their millions of users, they argued. Success of the “sender pays” effort could have had serious consequences for Google’s advertising-supported business model, potentially requiring the company to pay international carriers for carrying information from YouTube and other data-heavy sites. Under the proposal, “Google — amongst other big senders — would be unable to continue using freely the worldwide infrastructure network for which it did not spend a penny,” one observer wrote at the time. Google mounted a furious public campaign to defeat the proposals, saying the proposals would spell the end of the open internet and alleging that autocratic governments like Russia and China were using a closed-door process to censor users in their countries. The ITU criticized the Google campaign as misguided, while some authors said it merely masked the company’s business interests. 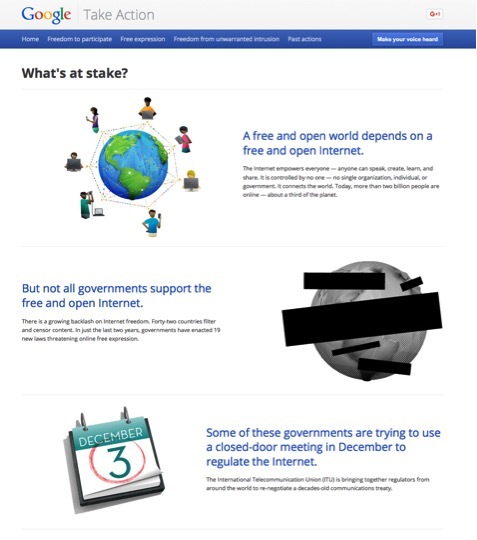 Google “has been a ringleader of a conspiracy theory that the ITU intends to use the ITR process to take over governance of the Internet and cater to nation states that want to censor and filter content,” wrote Jody Westby, an adjunct professor at Georgia Institute of Technology's School of Computer Science. Westby accused the company of “hyperbole” for suggesting that the “future of the Internet” was in jeopardy and suggested that the real reason for Google’s “self-serving” tactics was financial. The conference ultimately failed to achieve consensus because of divisions over the potential inclusion of network security and other internet-related issues in the rules. Although 89 ITU member states signed the final version of the treaty, 55 declined to do so including the U.S. and many of its European allies. Notably, the final version of the treaty contained no added text explicitly concerning the internet, internet governance, or information security. Google entered the conference with some unusual advantages. The U.S. delegation included four Google executives (Aparna Sridhar, Patrick Ryan, Sarah Falvey, and Ross LaJeunesse), more than any other U.S. company represented, including in the telecommunications industry. It had other, undeclared allies on the delegation as well. Every civil society or nonprofit delegate to the conference received financial support from Google according to an analysis of the company’s U.S. Public Policy Transparency web page and other publicly available sources. Delegates representing the civil society and non-profit sector included Ed Black with the Computer Communications and Industry Association (CCIA), Deborah Brown with AccessNow.org, Eli Dourado with George Mason University’s Mercatus Center, Harold Feld and Rashmi Rangnath with Public Knowledge and Avri Doria with dotGay. Doria is also a researcher and policy advisor to the Association for Progressive Communications, which has received Google financial support in the past according to APC’s “funding” page. A month later, on December 15, emails show Coffin scheduled another meeting with Google’s WCIT-12 team and Google lobbyists Johanna Shelton and Rick Whitt. Coffin’s Commerce Department colleague noted in a reply that Vint Cerf, the Google executive leading the charge against the ITU effort, was meeting with the Secretary of Commerce. The U.S. State Department didn’t formally constitute its official WCIT-12 delegation until nine months later in mid-September of 2012. The story also reported that Google had launched its own website urging users to take direct action against the conference. “Some proposals could permit governments to censor legitimate speech — or even allow them to cut off Internet access,” the Google site stated. Notably, the site that published the leaked documents, WCITLeaks.org, was co-founded in June of 2012 by two delegates from George Mason University’s Mercatus Center, which was among a handful of conservative groups to receive “substantial funding” from Google in 2012 for the first time ever. A day after Edelman forwarded the Forbes story to Shelton, Edelman met on November 28, 2012 with LaJeunesse and Google lobbyist George Ivanov at Teaism, a restaurant in Washington, D.C.’s Dupont Circle neighborhood. “Bob as the liaison with India – could you please follow up with the India delegation… k-y, as the liaison with korea – could you please do the same? In particular, there seems to be a lack of alignment on ETNO and security… I wonder if we could get them to be vocal on those areas where we’re in agreement – ROA/OA." On December 14, 2012, the WCIT-12 treaty collapsed after the U.S. refused to sign-on to the pact, citing its inability to resolve the impasse relating to internet issues. Canada and several European countries also refused to sign-on to the agreement. Even so, the U.S. successfully removed language requiring internet companies like Google to compensate foreign telecommunications companies for carrying data traffic on their networks, and the final treaty language added no provisions on internet governance. Still, Google wasn’t finished. In the aftermath of the conference, its executives and lobbyists renewed contacts with the White House and strategized on how to respond to a perceived threat from the State Department. Edelman replied, “what do you mean by engaging. You mean a larger hotwash of WCIT? Three days later, on December 20, 2012, the U.S. WCIT delegation attended a White House reception, visitors logs show. LaJeunesse and Edelman met privately an hour before the reception. LaJeunesse expressed his concerns in a separate email to Edelman that the company was worried it would spend 2013 battling the ITU instead of focusing on access in the developing world. He forwarded a letter from the U.S. Council for International Business to State Department officials seeking increased funding for IGF. One Google proposal shared with White House officials, and ultimately implemented, was an alternative funding mechanism for the Internet Governance Forum, a multi-stakeholder group hosted by the UN that has no members but draws governments, big business, NGOs and academics for policy discussions related to Internet governance. While the IGF itself lacks any mandate to make decisions or take action regarding internet governance, it is a key and influential discussion platform on internet governance issues. In this regard, Google’s embrace of IGF’s multi-stakeholder model can be viewed as an effective lobbying platform to stave off government regulation that would have an impact on Google’s business model. Patrick Ryan, a top Google public policy executive who was part of the U.S. delegation, expressed concern in emails to Edelman and State Department officials in February 2013 that the IGF’s lack of funding would result in the group being folded into an ITU forum where the multi-stakeholder commitment to Internet governance Google favored was less certain. However, Google apparently wanted to keep its fingerprints off of the operation. Ryan, who served as a member of the IGF’s Multi-stakeholder Advisory Group (MAG) in 2014 and 2015, proposed coordinating the funding through an International Chamber of Commerce group known as Business Action to Support the Information Society (ICC BASIS), so that financial support for IGF wouldn’t be too closely associated with Google. Despite having emailed the White House and U.S. State Department about the arrangement, Google’s Ryan pleaded ignorance of any U.S. government connections in his reply. The emails were released by the Google Transparency Project as part of its forthcoming archive of communications between Google and government officials. 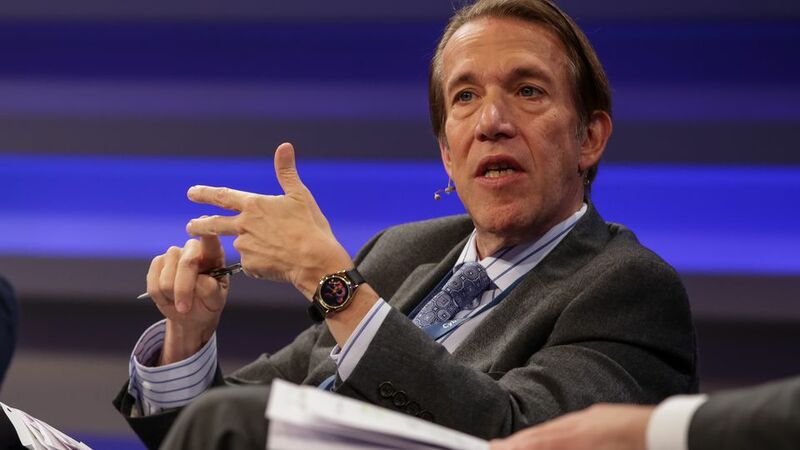 Some of the emails between Edelman and Google officials were previously released to another researcher, John Greenewald, but have not been reported on until now.